Furnace Bay Golf Course is host to many Corporate and Charitable Golf Tournament Outings. Our golf course is the perfect place for your next event. 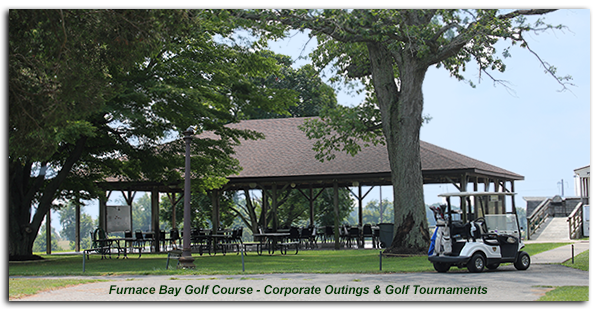 With our large open air pavilion just behind the clubhouse, we can provide a full range of services to make your golf outing or special occasion a success. Outing packages can be tailored to meet the needs of your special event. Catering is available for most events. After your round of golf, your group can gather to relax in our outdoor pavilion for good food, announcements, and prizes. Contact us to find out how easy it is organize a corporate golf outing or raise funding for your charitable organization and start planning your event. We are committed to creating a memorable experience for you and your guests. Give our friendly staff a call to book your golf outings today! We will customize a menu to meet your needs.